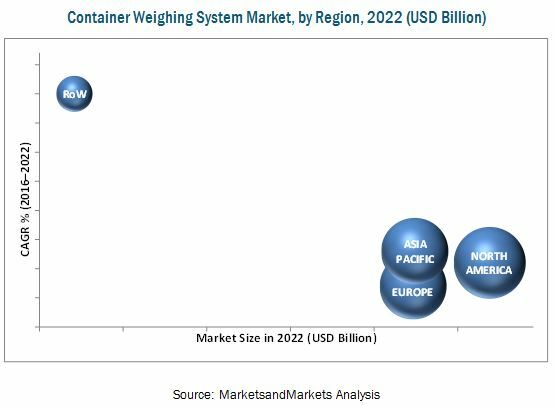 [145 Pages Report] The container weighing system market is estimated to be worth USD 3.95 Billion by 2022, at a CAGR of 4.6% during the forecast period. For the purpose of this study, the base year considered is 2016 and the market forecast is provided for the period between 2017 and 2022. This report aims to estimate the market size and future growth potential of the container weighing system market on the basis of different segments such as offering, medium, vertical, and region. It also analyzes subsegments with respect to individual growth trends, future prospects, and contribution to the market. The ecosystem of the container weighing system market includes Mettler-Toledo International, Inc. (US), Avery Weigh Tronix LLC (US), BISON Group Limited (UK), HAENNI Instruments AG (Germany), Ohaus Corporation, ATLAS WEIGHING PTY. LTD. (Australia), Hottinger Baldwin Messtechnik GmbH (Germany), Rice Lake Weighing Systems, Inc. (US), Flintec Group AB (Sweden), Sherborne Sensors Ltd (UK), Weightron Bilanciai Ltd (UK), Industrial Scale Company, Inc (US), Raymond Handling Consultants, L.C. (US), Fairbanks Scales, Inc. (US), and Cooper Instruments & Systems (US). This report focuses on the detailed segmentations of the market, combined with the qualitative and quantitative analysis of each and every aspect of the classification based on offering, medium, vertical, and geography. Based on offering, the container weighing system market has been classified into hardware and software. The products include weighbridges, reach stackers, container handling forklift trucks, ship-to-shore cranes, and rubber gantry cranes. Based on offering, weighbridges would hold the largest market size during the forecast period. The functional benefits such as load cells in weighbridges enable the end user to measure the weights accurately. Moreover, weighbridges are considered the legal weight measurement equipment across industry verticals and the use of weighbridges is the traditional method to measure the weights. The ports vertical is expected to hold the largest market share between 2017 and 2022. Ports account for the highest container traffic in 2016 and are expected to lead with the increasingly stringent regulations for enhancing the maritime safety, which requires the use of container weighing systems to measure the verified gross mass of the container. North America held the largest share of the container weighing system market in 2016. Stringent regulations for the safety transportation and increasing automation across the various industry verticals are the driving factors for the growth of the container weighing system market in North America. Factors such as the high cost of installation for meeting the weight measurement requirement using container handling equipment may hamper the growth of the market. However, the companies are expected to benefit from the mandated SOLAS regulations worldwide. The key players in the market are competing with each other through new product launches, partnerships, agreements, and acquisitions. Major players operating in the container weighing system market include Rice Lake Weighing Systems, Inc (US), Mettler-Toledo International, Inc (US), Fairbanks, Scales, Inc (US), Flintec Group AB (Sweden), Avery Weigh Tronix LLC (US), and Futek Advanced Sensor Technology, Inc (US). *Top 25 Companies Analysed for the Study are - Rice Lake Weighing Systems, Inc.; Mettler-Toledo International, Inc.; Avery Weigh Tronix LLC, Fairbanks Scales PLC; Flintec Group AB; Hottinger Baldwin Messtechnik GmbH; Bison Group Limited; Sherborne Sensors Ltd; Weightron Bilanciai Ltd; Strainstall UK Ltd; Conductix-Wampfler GmbH; Tamtron OY; Futek Advanced Sensor Technology, Inc.; Bromma; Kistler-Morse; Pepperl+Fuchs, Inc.; LCM Systems Ltd; Belden Incorporated; Ohaus Corporation; Atlas Weighing Pty Ltd; Strainsert; Jiuding Weighing Equipment; Interface, Inc.; Griffith Elder & Co Ltd; and Raymond Handling Consultants, L.C. 12.2 Rice Lake Weighing Systems, Inc.
12.7 Hottinger Baldwin Messtechnik GmbH. 12.11 Futek Advanced Sensor Technology, Inc.
12.13.5 Atlas Weighing Pty Ltd.